SCS Software's blog: Spoiling the driver with too much luxury? Some of the things we are thinking of for Euro Truck Simulator 2 are a bit outside of the the norm, like this luxurious Actros cabin design. It is still an open question if we can pursue such direction, if we can integrate unique things into the game without having them sticking out too much, and also if truck companies wouldn't mind us getting too involved with the cherished special limited editions of their tractors. WoW !!! Amazing work guys,every day nice news! Thank you scs best game ever! I like what I have seen in these photos. I think you should do this. This is so beautiful. Please, I beg you, zoom in on the instrument panel, I BEG YOU! It would be nice myself in the design studio to change the trim in the cabin and other tuning. Thus the company would be respectable and would have been good offers from the companies shippers. SCS, how about Jumbo trailers? Oh my fu*kin´GOD GOD GOD!!!!!!!!!! i can´t speak, the Interior, oh my god... this.. i am in love, awesome!! How how very niiiiiiice ! NO way, keep adding details like that, great work, BTW , please improve rain System, would be very nice if you can make it more realistic as it is on Rig n Roll, also physics are very important !! You should make an option when buying a truck whether you want the luxury or regular interior, and or course the regular costs significantly less. Nice work, I can't believe it is so nice. Much improved over the previous games. Can you post a video with the rain system? Thank you! Nice interior, but you should modify or remove that gas station prefab because it doesn't have appropriate accelerating and exit lanes. Now you're just showing off...! Wow, Mercedes-Benz Actros Trust Edition?! SCS you really know how t o make good things!Great work,continue like this. Did you think to make a scenario mod for ETS2 ? where the gamer start as simple deliver with a small van to earn some money and to make savings with deliveries,buy (several) truck more and more big to finish to become a boss and manager of a truck compagnie...? it could be very interresting ,don't you? I think you should add this feature in ETS 2 if the companhies dont't mind. Also, you can add this like a "tuning" option. For example, the same way we can upgrade the engine, steering and fuel consumption, why not upgrade the interior to be more confortble for the driver, maybe reducing how much the driver become tired? Looks amazing. Keep up the excellent work SCS Software team. NICE JOB GUYS .I HOPE WE CAN FEEL FINALY MOST REALISTIC SIMU DRIVE ! THNx scs FOR ALL OF YOU !! Yes, as some guy (Anonymous @11:43 PM) before me said, why not to make these luxurious things as tuning accessory? It could cost relatively lot of money... Also I like his idea that comfortable seat could reduce tiredness factor, but maybe it would be too much complicated for trucking game, I don't know. Still, interesting idea. But tuning not only exterior, but also interior, is surely one of things which force player spend more and more time in a game, and it's a one of goals, isn't it? just do like RIG'n'roll, make customisible interior and make it possible to mod new interiors so poeple can have what they like in there cab. anyway great work looks awsome. ps srry if it is bad inglish. if you look here . very good scs, very luxury, its beautiful!! please dont forget the crash barriers, in the hole europe on all motorways are crash barriers!!! Does all those buttons work? I guess not all. i am not so sure abort the center in the dashboard reminder you have stuff were and it will not work in real . maby if you change it to the red leather from the chear you have use . There control buttons should be functional, Distribution board should have a lot of track function. The world of ETS2 must life and be impredictable. Video effects aren't most improtant. Importan is life of trucker in virtual world. 2. The wippers should have more functions : Wash, slow motion and fast motion. I like it, even Mercedes isn't my favourite truck, but i like what i see. Yes thats great. Go on SCS! * Also could you change the petrol stations. i mean the one in the pictures on the actross because they are very basic!! also and feature to go to the Petrol station not just to get Fuel but add-blue aswell! * Rain is also a big feature in the game, Rain needs to be more promising in Euro Truck Simulator 2, make the wipers spray screen wash over the window to clean the screen for better vision etc... this is possible as OMSI Bus Simulator have done so. Please look into this! * Lights, button funtions where you can have sidelights, normal lights, full beam and then full beam when you let go of the buttom they will go off like for letting a car pull out or a lorry going into your lane. I hope i havent gone on to much but you are doing such a great job on the game i think why not put that little bit more in ;) great job SCS!! Ill be glade to help! 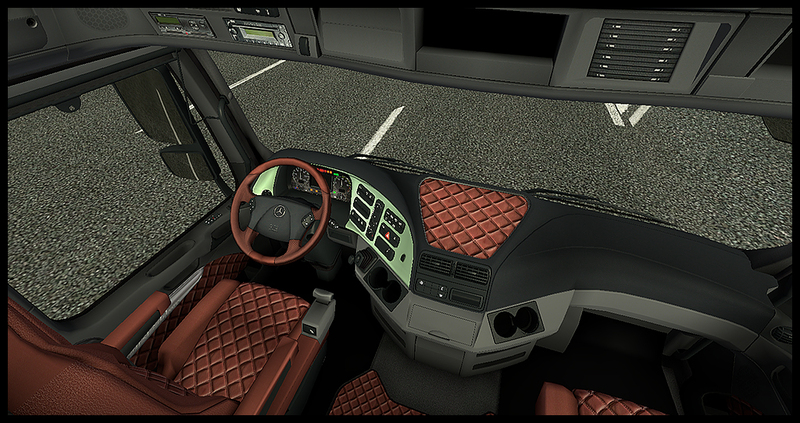 I like new interior, good job SCS! Good job SCS. I hope that the truck companies will accept this. And it will be better if we could edit the colors in the game too. Not only a single color. Please. Please don't forget to add the cb-radio. It would be good to be able to purchase land to set up a depot, station lavage.On could have used, manage their course and he could not ride on weekends and be able to have several trucks / remorque.Il be able to import image to paint the truck or trailer and putting lights where you want (tuning) and ability to change phares.Il could store (station) we could buy small interior decoration (eg small lamp ...). Compared to interior should be able to choose the couleur.On could change the semi truck and all our transport company. THANKS for your work is great. must do for Vabis Classic Steering wheel tune! Such a cabin needs nobody. Just as trucks with two steering axles. Looks good, but this also needs no one. Also, may I please show us lainy view? I like the interior, it is really nice.